Positional Release Techniques continues to be the go-to resource for those who want to easily learn and confidently use this manual approach to safely manage pain and dysfunction in humans (and animals). As well as a structural revision, the fourth edition now includes new illustrations and chapters with videos and an image bank on a companion website to reinforce knowledge. 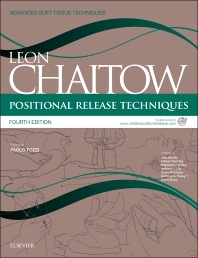 At its core, the book explores the principles and modalities of the different forms of positional release techniques and their application which range from the original strain/counterstrain method to various applications in physical therapy, such as McKenzie’s exercise protocols and kinesio-taping methods that ‘unload’ tissues. These methods are traced from their historical roots up to their current practice with a showcase of emerging research and evidence. In addition to a series of problem-solving clinical descriptions supported by photos of assessment and treatment methods, learning is further boosted by practical exercises which examine PRT methodology and the mechanics of their use.